Now this is a fundraiser! Last year more than 35,000 people attended the Big Country Balloon Fest in Abilene, Texas. Coordinated by the Abilene Optimist Club, the event expects to raise approximately $60,000. Of course what really gets raised are both hot air balloons and spirits. Fourteen balloons took to the sky at the festival, including three different balloons from last year. There were also family friendly activities throughout the weekend including performances by they Austin End of the Line synchronized kite team, balloon rides, food, entertainment, train rides, pony rides and more. Photo taken by Jason Holder shows a cluster of balloons during the balloon glow. Click here to see the complete gallery of pictures in the ReporterNews. St. Maarten will hear from some of the island's most talented young people on October 4 when the Optimist Club of Soualiga hosts a Gospel Song Fest. Ten individuals and two groups all beteween the ages of 7 and 15 will come together for a group performance and then face-off against one another to determine the champion of champions. The Song Fest is chaired by Optimist Club member Angel Lecroes. She explained that the objective of the program is to allow young people to express their creativity in song and to share a positive message to the community. Tickets are being sold to the event, $10 for adults and $5 for children. Funds raised benefit other Optimist Club projects for youth. I like Optimist Club stories that honor children for doing the right thing. This time it is a young man from Belleville, Illinois that stood up to 14 other students who were attacking another student on a school bus. Shocking video footage showed the group ganging up on one student, not once, but twice. Thanks to Steven Raines, a junior at Belleville West High School, the attack was stopped as he intervened and sat next to the threatened student for the remainder of the ride. 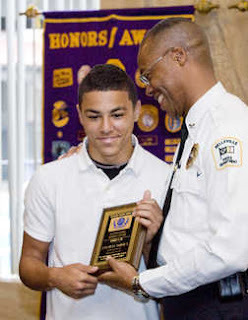 "I appreciate being recognized for what I think is a small thing that I did -- just something that was right," Steven said as he accepted the award from Chief of Police William Clay on behalf of the Belleville West Optimist Club. According to Barbara Beuckman, Optimist Club co-president, Steven's actions confirm that young people are willing to stand up for what is right. She believes that is a testament to parents like Steven's who teach their children good morals. Violence isn't funny. Congratulations and thank you Steven Raines for making a difference. Photo from the Belleville West Optimist Club. I was drawn to the headline "City of Lockport: Community Night to feature a lot of free stuff" admittedly because it was both funny and intriguing. First of all, "a lot of" is an indeterminate amount. I wondered is there enough free stuff to go around? 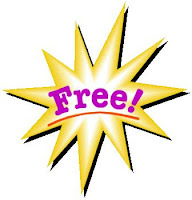 Second, what kind of "free stuff" are they handing out? Is it stuff I want? The key to this headline really shouldn't be the offer of free stuff; but instead, our attention should be drawn to community. It is somewhat sad that it takes the lure of receiving something material to get us to recognize the many intangible benefits that our community offers us every day. At this event in Lockport, New York, residents will learn first hand about Boy Scouts, Girl scouts, YMCA, the city youth and recreation department, Care Net, Lockport Cares, several Optimist Clubs and churches that offer non- sectarian outreaches such as GED programs. Don't forget, those organizations that will help you grow both personally and professionally will also offer you some free stuff just for attending and learning more about living in Lockport. After all, it is a learning fair complete with fair food, family -friendly activities, and details on how to access city services. I hope the residents have fun at the fair on Thursday, October 1, 5:00 to 8:00 pm at Genesee and Waterman Streets, Lockport; I hope they get their free stuff, but I also hope they join a club and get involved too. The Tri-County Optimist Club of Pulaski-Krakow, Wisconsin held their fourth annual car show on September 20 with more than 150 vehicles on display. Not all were cars, as this photo shows us, but all were lovingly cared for by their owners and ready to meet show quality standards which equal "Showin'off for a reason." One hundred percent of all funds benefit charity said Optimist Club president Nora Scray. Last year registered cars contributed $1,000 to the Childhood Cancer Campaign. Optimist International has contributed almost $1M to research to eradicate childhood cancer at John Hopkins University. Local funds are available for families and children who need them. In the photo: Roger Burmeister and his 1951 Masey-Ferguson 35. The Optimist Club of Carrollton, Georgia recently came together with the Ferst Foundation, Carroll County Schools and others interested in increasing childhood literacy to support early reading skills. Through fund raising efforts the Foundation brings books to the community by offering annual subscriptions. 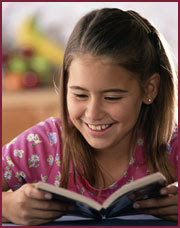 For an annual investment of $36, a child will receive one new book per month. Parents say that receiving the book is like opening a present and the children can't wait to read them, often together with their parents. And that is just what the organizers want to hear, but to make it happen, it takes a lot of support from the community. First of all, the books have to be purchased; the subscriptions have to be sold or donated; and then the books have to be delivered. The community contributes at all levels, with much happening at the Burgers, Bands and Books Festival. Families are entertained, silent auctions take place, books are sold, donations are given, and families sign up for the service while those that can't afford it are matched with sponsors willing to help. In the four years that the activity has been held, the Carroll County Schools have tracked the results and claim that children participating in the program are reporting higher scores than others who have not. So what does the Optimist Club do? On the day of the event, they work to bring out the best in kids offering a putt-putt course while parent shop. Other activities are face painting, storytelling, performances from local bands and food. After the event, the Optimist Club is one of many civic organizations that donate to the cause. "I'm here for the kids and it's just a lot of fun," said Optimist Club member Bob Myers. Not only is it fun, it is a valuable community asset. Keep it up! On September 12, the United Way in Bay City, Michigan brought service clubs together for a Day of Caring at the W.R. Bush Elementary School. Members from the Optimist Club, Rotary Club, Leadership Bay County and local merchants gave their expertise, time, materials and labor to create an outdoor reading area, refurbish the landscaping and paint games on the blacktop for the students to enjoy. Families and students also got involved in the Day of Caring and by the end of the day, the children were able to enjoy the fresh play area with hop scotch, four square and refreshments served up by the partners. What a great way to get a lot of work done in a short period of time. It's good that the Optimist Club was involved with other groups and many clubs do serve as volunteers when they are called upon. My encouragement for you today: don't be afraid to step out of the pack and be the leader. Your Optimist Club can inspire others to come together to make real improvements in your community. As the school year gets underway each year, the Optimist Club of Gilbert, Arizona plans two major projects. One is the Gilbert Halloween Carnival and the other is a Child Identification program. 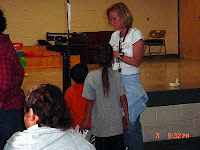 Both bring them in direct contact with students to help teach and keep them safe. The Child ID Program weighs and measures students, takes their fingerprints and pictures and collects information needed to help locate the child should they ever turn up missing. The kit also help parents learn what to do with the information to keep it safe and up-to-date. The Halloween Carnival has a big emphasis on safety as well. By teaching kids safe Halloween practices and providing a party at the school, the Gilbert Optimist Club places an emphasis on the well-being of the children in their community. The Hereford Optimist Club in Monkton, MD was formed in 2001 and every year they have served their community with programs that include Shop with a Cop, Essay and Oratorical Contests, Adopt-a-Highway, Youth Appreciation and the Chain Gang. Yes, you read that right: the Chain Gang. According to Optimist members, this is the easiest project to fill with volunteers. 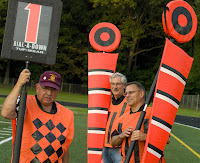 Every week during the school year, for varsity and junior varsity football games, Hereford Optimist Club members serve as the "chain gang" that measure and mark the ten-yard indicator for a first down. They claim they have the best seats in the house. I have to say I agree. Congratulations to the Hereford Optimist Club Chain Gang. The dinner recognition banquet will be held at the Boys and Girls Club on September 24. According to the Optimist Club this event is a great way to recognize individuals for the inspiration they provide to others, especially children, throughout the year. Shown here is Robert Waggoner, Noontime Optimist Club of Camarillo's choice for Educator of the Year 2009. Nothing says service like asking, "How can we help." 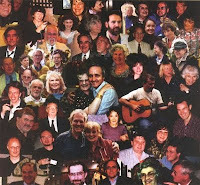 In that spirit, the Optimist Club of Sandy, Oregon has added a page to their website specifically for that purpose. Their offer is meant for students in the Oregon Trail School District. Not only does it reinforce that their organization is a service club and open to all in need, it allows the potential recipient an expedient and private method to make their request. Tip for the week: make your Optimist Club approachable - add a "What can we do for you" button to your website. Raffles are a popular fundraising activity for many Optimist Clubs. This post is to highlight a dollhouse raffle for the Optimist Club of Baldwinsville, New York. The dollhouse was donated to the Optimist Club. Members will be selling tickets until October 10 when a lucky winner will be drawn at during the community's Octoberfest celebration. Shown in this picture are Baldwinsville Optimist Club members Charlie Ebner (seated), Patricia Dickman and Donald Varn. 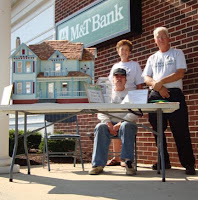 While the primary purpose of hanging out in front of the M&T Bank is to sell raffle tickets, the side benefit is they get to talk about the great projects that the Optimist Club does in the community year-round. Good luck! It's not the prettiest Optimist Club website, but it's effective. I reached the Optimist Club of Weatherford, TX by accident. Qwest for some reason gave me five choices from a mispelled URL and with one click, I landed on a club website that I might not have otherwise seen. 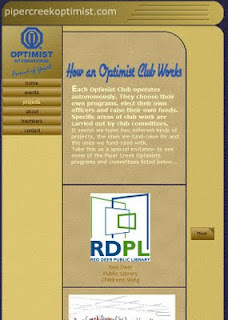 So what makes the Weatherford Optimist Club website effective? Authenticity! Meet Randall Grissom. 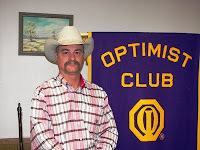 He is the 51st president of this Optimist Club that was chartered in 1958. They pride themselves on being friends of youth. They conduct youth projects and provide a link to all of them along with pictures and contact information and you can see a list of other people who are proud to call themselves Optimist Club members. It is the real deal. Slick, professionally built websites sometimes lack the heart and passion that can be found in our smaller efforts. I enjoy seeing both, but given the choice, I'll take passion anytime. Does your Optimist Club issue a press release when a new member joins your ranks? Do you celebrate the event by giving them kudos, a little professional lift and boosting your club's image as well? A press release allows your club to tell your own story. A press release is an opportunity for your club to promote what's happening, be it a new member, a service project or a fundraising activity. A press release establishes authority. It declares to the media and others that your club is the place to go for questions or actions on certain subjects. I've seen a few press releases over the past months where new members are welcomed to Optimist Clubs in Albemarle, NC, Farmington, MI, and now Auburn Hills, MI. All have offered a picture of new Optimist Club member. All have shown the Optimist Club banner in the background. But this latest one showed something else to me: staying power, longevity and partnerships. What made this one different? This press release was issued by the new member's employer, Genisys Credit Union. According to the story, Nicole Bowen was welcomed to the club by her supervisor and sponsor Linda Zabik. I know that Genisys supports the community and now I know they think that the Optimist Club is the club of choice. After all, they support it with two members. In this case, Genisys Credit Union became the authority on the Optimist Club of Auburn Hills, MI; but that is okay. They share commitment and purpose and back both up with resources to help the community grow. What a great partner in service! 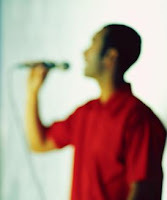 Optimist Clubs - entertainment or experience? Have you ever given much thought to your decision making process? Do you think before your act or do you just reach for more and more, bigger and better? This video talks about choosing simplicity and savoring the experience instead of placing value on how it was delivered. Optimist Clubs frequently fall into the delivery mindset. They choose projects that entertain a large number of kids without stopping to think about the experience that the child is having. Many times, the project becomes so large, the club spends most of its time on administration and less time with the children. Don't let this happen to you. Choose your Optimist Club projects with quality time in mind. Children enjoy being entertained, but they yearn for attention. Children like to win, but they hunger for the reassurance that leads them to achieve. Your Optimist Club is unique as the only service club whose mission is to work hands-on with children and bring out the best in kids. That is how we share and experience optimism. Here is another service club competition and this time children receive a direct benefit. Six service clubs in Gratiot and St. Louis Counties, Michigan competed in the Annual Sock Off. The winner is determined by the club that collects the most socks and under clothing for children. The proud winner of the Golden Sock Award for 2009 is .... The Exchange Club. Also participating were the Optimist Club of Gratiot County, Alma/St. Louis Rotary, Breckenridge Rotary, Kiwanis Club, Exchange Club and Ithaca Rotary Club. Together the clubs collected more than 2,000 pairs of new socks and underwear for the Back to School project. Now in its sixth year, the Back to School Project provides clothing and school supplies to children in an effort to ensure that they have the basic tools to succeed at school. Some Optimist Clubs meet for a single purpose. They might host sports programs or raise money for pet projects. Single purpose clubs focus their meetings on reaching their predetermined goals. However, the traditional service club model followed by most Optimist Clubs is to meet regularly, usually every week, so that members can learn about their community. Networking, fellowship, club business and project planning take place; but perhaps the most rewarding part of the agenda is the opportunity to hear from community leaders, other organizations and individuals about their programs, projects and objectives that affect the quality of life in your community. 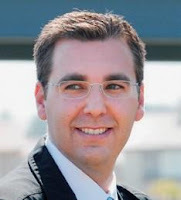 So when I tell you that the Optimist Club of Cerritos, CA recently welcomed Cerritos City Manager Art Gallucci to a breakfast meeting where he talked about economic development, tax receipts and the City Redevelopment Agency, you will understand how important I believe club programs are to a strong a healthy Optimist Club. Civic engagement is necessary and relevant to our personal and professional life. This allows us to direct our volunteer efforts to where they are needed most and are the best fit for our personalities. You might be wondering, how does economic development fit with Optimist International's mission to bring out the best in children? The quick answer is by ensuring a good quality of life; but the long answer would be Optimist Clubs do much more than bring out the best in children. We are civic partners and we provide services and support in our communites where and when they are needed. When you get involved with an Optimist Club you serve children and adults - some you know and some you don't. You serve your community and ensure it is a great place to live today and tomorrow. You are needed; get involved, join an Optimist Club today. The Rotary, Soroptimist and Optimist Clubs will challenge the reigning Kiwanis Club for the gold medal in the Second Annual Service Club Olympics in Fremont, Ohio. The event kicks off at 9:45 a.m., Sunday, September 13 in conjunction with the Joy of Living Farmer's Market in downtown Fremont. Friendly competition will take place in Prescription Polo, Stimulus Shop Put, Carpet Curling, Brain Freeze Fencing and Try-athalon. No, I haven't a clue as to how they will be played, what the rules are or how competitors will be dressed (business suits, perhaps? ), but I know it will be fun. Getting together with other service clubs and building cameraderie and community spirit is part of the joy of belonging to an service club. In addition to being given a gold medal and bragging rights, the winning organization will be awarded $500 for their cause. Sharing pride and purpose is the cornerstone of an engaged community. There are no losers in this bunch! Optimist Clubs are an opportunity for people to be involved in their community, provide service and give back something to society as a whole. They also provide avenues for social engagement and the opportunity for personal and professional development. The Optimist Club of Conway, Arkansas has stepped outside the typical mold for an Optimist Club and helped start a new club for developmentally disabled adults in their city. The first of its kind, the Sunshine Optimist Club of Conway was organized on September 9, 2009 with 46 members. It is expected to grow to 55 or 60 members before closing the charter period on September 30. Many of the newest Optimist Club members are already engaged in other clubs, churches, political advocacy, and Special Olympics. With mentoring and support from the local club, Jackie Fliss, Executive Director of Independent Living Services predicts the Sunshine Optimist Club will be successful. According to Optimist District Governor Mike Bess, it is a model that will be looked at for starting other Optimist Clubs around the world. Children in Plymouth, Michigan look forward to this event all year for it is the one time that they get to stand in the spotlight with their pets, be it an iguana, dog, cat or hamster. Annually during the fall festival, the Optimist Club of Plymouth hosts a Pet Show. Pre-registration is not required. All that is needed is enthusiasm and a pet. While all types of pets are welcome, Optimist member Jim Hutchings says that dogs far outnumber all others. The dogs also have the most award categories including longest ears, longest tail, best dressed and best tricks. The Plymouth Fall Festival Pet Show is Saturday, September 12, 9:00 a.m. at the Main Stage, downtown Plymouth. "It's always a great event," promised Hutchings. I bet it is. I hope they send me pictures. I see a lot of different fund raising activities for a lot of different purposes. I really like this one for its simplicity and branding. The Slice of Life, hosted by the Optimist Club of West Knoxville, benefits the East Tennessee Children's Hospital and Childhood Cancer Research through a pizza tasting party. Each ticket purchased allows the ticketholder to sample and enjoy pizza. Who doesn't enjoy pizza? According to the organizers, at least six pizza vendors are signed on to participate. The pizza tasters will also get the opportunity to vote for their favorite. Tickets are reasonably priced at $10 for children 13 and over and adults; $5 for children 4 to 12; or a family pack (four or more) for $20. Children 3 and under will be given free cheese pizza slices. The event will take place on Thursday, September 17, 6:00 to 8:00 pm, in the Farragut High School Commons. Optimist International international encourages Optimist Clubs to conduct projects that benefit Childhood Cancer research. The international organization has donated almost $1 million to John Hopkins University. All proceeds from the Optimist Club of West Knoxville's Slice of Life pizza party will benefit the East Tennessee Children's Hospital and Childhood Cancer Research Institute. It's that time of year when children are back in school, vacations are over and our thoughts return to personal and professional development. That's probably why so many clubs and organizations hold membership drives in the fall. In an article for the Kansas City Star, the director for the United Way in Wyandotte County described many of the service clubs in her community. "Join one and make a difference," Diane Hentges said. A great suggestion, but I want to emphasize that not only do you help others when you join a service club, you also help yourself. 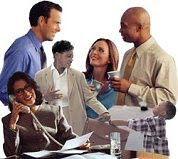 There is that intangible, feel-good factor that lifts your spirits when you do something to lift others up, but there are also tangible benefits such as increasing your network of business acquaintances. Sometimes people will ask me why they need business associates if they don't have a product to sell. I always explain, but you buy things. Isn't it nice to buy from someone you know and trust? When you join a service club you will also enhance your social circle and find new friends with similar goals and dreams. New friends open your life to more new opportunities. Don't miss out on a single one. Are you ready to make a difference? I hope that you make the Optimist difference. Join an Optimist Club today. Find an Optimist Club in the US, Canada, or another country. Yes! Remembering the great tagline, "The Optimist difference...it's all in our name," allowed me to find others that are promoting that great message. 1. An Optimistic Attitude - Optimists believe that a positive approach can make all the difference in the world. 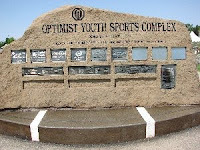 Through hands-on community and youth programs, Optimists brighten spirits and create hope and confidence in the future. The Optimist Creed provides proof of the Optimists' philosophy. 2. Youth & Community Service - Along with the Optimists' motto, "Friend of Youth," comes the commitment to help, educate, inspire, and believe in tomorrow's future--our young people. Optimists believe that by investing in youth, we can ensure a better tomorrow. 3. Personal Development - Optimist Club members receive as much as they give. Optimists have endless opportunities to gain leadership experience and to grow personally and professionally. Optimists value the social and business relationships they develop with individuals from a cross section of their community. Another is the Indiana South District of Optimist International. In addition to learning that the positive attitude is what differentiates Optimist Clubs from all others, they also tell you that the Optimist Clubs of the Indiana South District have served 104,203 children from October 1, 2007 to Sept 7,2009 at 04:11 pm. Kind of a fun, interactive tool to encourage you to find out how. When you click here you will not only learn how they do it, but how many children benefit from each activity. What a great touch. Does your Optimist Club or District promote the Optimist Difference? Be sure to let me know so we can tell others. Thanks! Sometimes I run into websites that tell the Optimist Club story in an unique way. Today I found one of those and I invite you to take a look at the Piper Creek Optimist Club of Red Deer, Alberta, CA with me. Beginning at the home page, you will know that you want to be an Optimist Club member if you want to take a positive approach to life. They have kept an older tagline for Optimist International as their centerpiece: the Optimist difference...it's all in our name. I like it! Events = fundraising activities that you will want to attend. Click on the more buttons to find out why. Projects = the activities the Piper Creek Optimist Club conducts or supports in their community. Again, the more button will let you find out all about them individually. About = shares the purposes of an Optimist Club and links you to more information about Optimist International, the formation of the Piper Creek Optimist Club and the Alberta, Montana, Saskatchewan , and N. Wyoming District and the Optimist Creed. Again, click the more button to learn more about each topic. Members = You guessed it! Information for members, but such information is relevant to the community at large. Kudos to the web designer for not password protecting it and allowing everyone who cares to know what the Optimist Club of Piper Creeek is doing. Contact = Yes, contact information seems pretty simple, but they have even included instructions for how to request funds as well as how to join. Yes, this is an approachable club. If you live near Red Deer, Alberta, please join, for the Piper Creek Optimist Club looks like an engaged, well-organized, professional asset to the community. The City of Farragut, Tennessee has granted $2,500 to the Optimist Club of West Knoxville for a recycling program. What a great example of how an Optimist Club partners with their local communities to provide services that their citizens truly need. In this instance, the recycling program is targeted at recycling old, used electronics equipment. Last year, the event garnered 213 tons of discarded equipment from 6,000 households. Getting the word out early and with the city support will probably bring in even more electronics gear this year. The event "Plug into your Community" will take place on January 9, 2010 at Farragut High School. There is no cost to the public for disposing of items. Donations will be accepted to help subsidize the labor costs associated with disassembling and destroying the equipment. In case you are worried about a breach of security on your old computer, don't, says Optimist spokesperson Brian Osgood. All hard drives are shredded. What a great way to be environmentally friendly and techno-savvy. Thank you for your service! The Optimist Club of St. Simon's Island, Georgia is celebrating fifty years of serving their community this year. They recently held a party at the King and Prince Beach Resort where new and old-time members gathered for an evening of merriment. Thirteen past presidents and the original Optimist of the Year were present as was Charles. L. "Buck" Buckalew and his wife Marge. Buck is the longest continuously serving member of the St. Simon's Optimist Club and the senior member of the Georgia District. He is also known as the chief of happiness because he always wears a smile. But the real story of this gentleman's optimistic life is best seen as the feature article in the Golden Isles Magazine. Click to the profile page of the Sept-Oct edition and read all about it. Then forward to page 62 and enjoy pictures from the Optimist Club's 50th anniversary celebration. It's a very nice tribute to the Optimist Club of St. Simon's Island. Football season starts this week in Boise, Idaho when the Boise State Broncos take on the University of Oregon Ducks. That close rivalry will fuel football fever right into the weekend when the Boise Noon Optimist Football program kicks off at the Optimist Youth Sports Complex. More than 8,000 children participate in this dynamic program at the multi-million dollar facility developed by the Boise Noon Optimist Club and the City of Boise. The football program began in 1949 and has always remained a volunteer program. Optimist teams are not arranged by skill, but instead by neighborhoods according to age, weight, and residence. The kids play an eight-week program and are coached by Optimist members and volunteers who return every year to instill good sportsmanship and leadership skills to these young athletes. The Boise Noon Optimist Club provides opportunities for other nonprofit organizations to earn money manning the concession stands during the season. They have also expanded their program to adjoining communities by sponsoring new Optimist Clubs in Emmett, Horseshoe Bend, Mountain Home and Nampa, Idaho. Over the past ten years, the Nampa Optimist Club Football program has grown in a similar manner and they also own and operate a facility in the neighboring community that serves another 4,000 kids. These are great examples of how an Optimist Club can work with city officials,businesses, community leaders and volunteers to develop infrastructure and programming to meet the demands of a growing community. Beginning with football fields, the complex has added soccer fields, concession stands, playgrounds and most recently a tennis court. More tennis courts are planned for next summer and there is still room to grow. The community is grateful for the hard work of these dedicated volunteers. Thank you Optimist Clubs! How many times a day does someone tell you have a good day? How many times do you repeat the refrain just to be polite and to finish the conversation? I wonder why it is that we only wish people a good day instead of a great day or a super day or the best day possible. It could be that we are afraid that they will have a better day than us. Or it might be that that the phrase has become merely a colloquialism, something said in passing that has lost true meaning. I hope not. I prefer to live in a society that extends well wishes to others and that is why I have decided to always wish my friends, family and colleagues joy. Joy is the wish that tops all wishes. Formerly used primarily around the Christmas and New Year holidays, I hereby proclaim that joy should be experienced by all every day. Yes, we need all the good things in our lives every day. Start every day with joy.